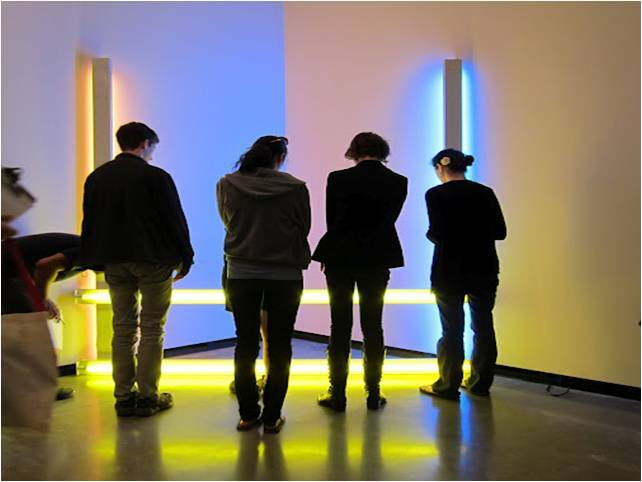 Students interact with Dan Flavin’s “Untitled (to Donna) 2” (1971) at the Portland Art Museum. Photo by Sarah Wolf Newlands. Karena, a senior at Portland State University, leads us to reflect on a pool of natural light in a gallery at the Portland Art Museum near a Robert Irwin light and space sculpture. The effect is a state of near-meditation. Another student, Lisa, asks us to consider the different ways in which we value a work by Dan Flavin. We then move to a darkened classroom to collectively make our own version of a Dan Flavin sculpture out of glow sticks. She informs us that she will be auctioning off our completed work, and that the proceeds will be going directly to the electric bill in order to keep the Flavin work running. The preceding examples are projects developed by students for a class at Portland State University, called “Object Talks: Creating Meaningful Experiences at the Portland Art Museum,” co-taught in the summer of 2011 by artist and professor Sarah Wolf Newlands, Stephanie Parrish, a senior staff member in the Portland Art Museum’s Department of Education and Public Programs, and myself. 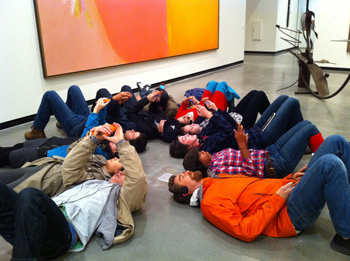 The class was an experiment in opening up the interpretation of the Museum’s collections to college students through experiential, conversation-based interpretation informed not only by best practices in the field of museum education, but also by the work of artists engaged in social practice. We collaborated with artist/educators Jen Delos Reyes and Lexa Walsh from Portland State University’s Social Practice MFA program to introduce students to this form of art-making, which we feel shares many concerns with the work of museum educators. 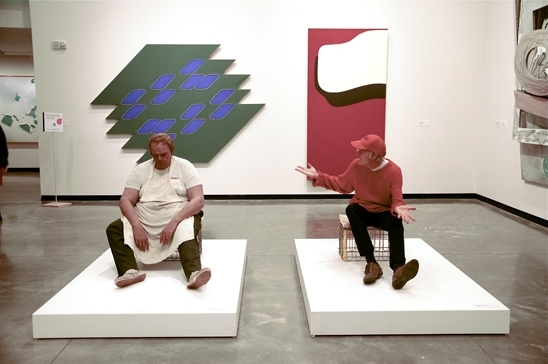 These mutual concerns include the need for outreach to communities not necessarily involved in the art world, movement towards the so-called “educational turn” in museums, a desire for collective involvement and collaboration—and above all, an interest in the shared social space that constitutes an experience with a work of art. This linkage between artist and museum educator is nothing new, and its history is chronicled in this excellent article by Michelle Jubin. 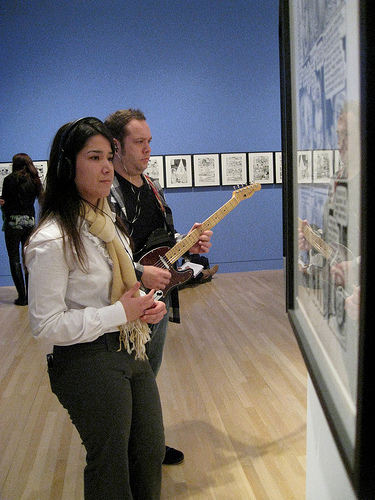 However, the involvement of students in this process, who are not necessarily formally trained as educators or artists, and yet, are performing these roles in public outside of the “laboratory” of the classroom, raises questions for me about where the role of interpretation in a museum lies and who has ownership of this process. The training period for docents at the Portland Art Museum is over a year and an MFA in social practice is typically a two-year endeavor. University Museums often employ college students as docents; however, they typically receive much more training than we were able to offer on this class. Our students had eight weeks to craft and deliver their interpretive experiences. A cynic might suggest that we are devaluing a complex skill that requires more expertise than a summer class can provide. Furthermore, this course is part of the college’s University Studies program, a general education requirement for all students which is very interdisciplinary in nature. Critics of these programs often point to interdisciplinarity as responsible for what they believe as the death of specialization. However, I would like to consider this topic through the lens of the deskilling—and indeed, reskilling—movement that has been a concern for artists since at least Duchamp. 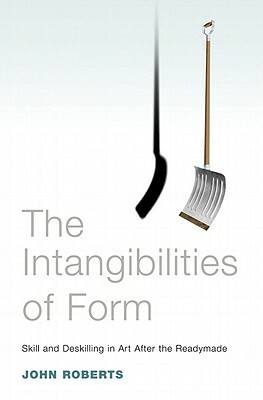 In Intangibilities of Form: Skill and Deskilling in Art after the Readymade (a review and summary can be found here) John Roberts addresses this very topic and its implications for the art that has followed Duchamp. His discussion of the readymade and its role in deskilling the work of the artist’s hand in favor of reskilling an artist’s work in the realm of immaterial labor is particularly appropriate for socially-engaged artists. However, I would like to consider this same process of deskilling and reskilling in light of our class. 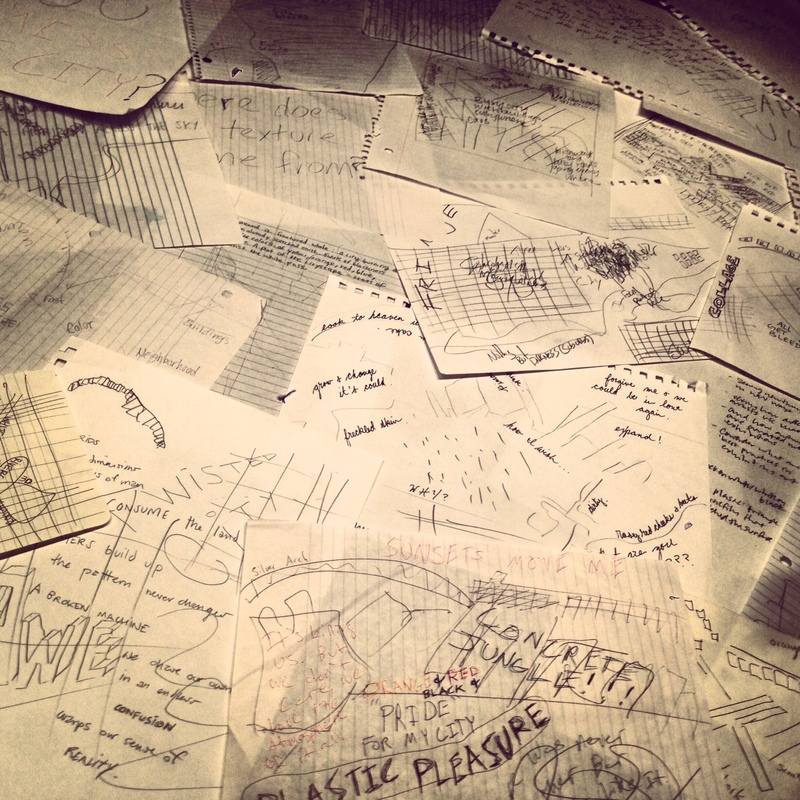 When confronted with the open-ended conversational gallery teaching techniques advocated by Rika Burnham, Elliot Kai-Kee, and many of the other museum educators that they read during the term, several students expressed concern in what they felt was a disengagement from the art historical structures that had colored their past experiences with art. Nor did they like the process of moving away from the more lecture-based modes of presentation they were accustomed to from their art history classes to relinquishing some level of control to their audience for the more conversational methods of inquiry that we advocated. Admittedly, these responses surprised us—even though we are used to these tensions between the fields of art history and museum education, we did not expect them from our students. 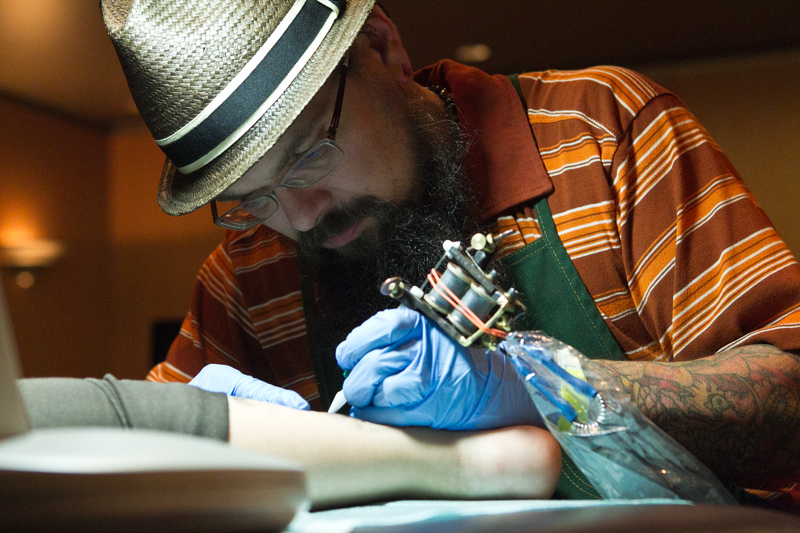 Though, in the strictest sense, the term “deskilling” refers to the process of eliminating skilled labor in the workforce in favor of time-saving technologies, it has taken on new meaning within arts discourse. It is linked not only to a movement away from artisanal production in the visual arts of the twentieth century, but also significantly, in aesthetic valuation (Roberts 86). In this sense, deskilling acts not only on physical labor, but on intellectual work as well. 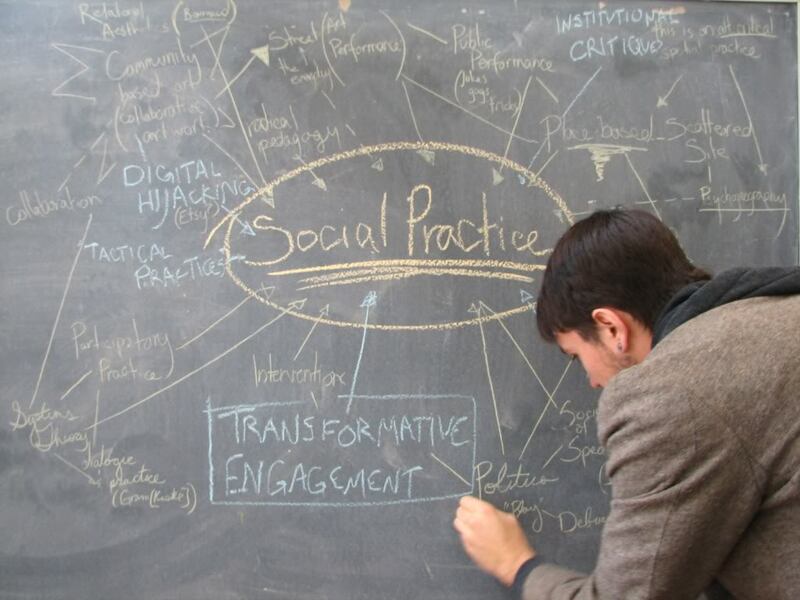 It also takes on new meaning in social practice as a way of democratizing the artist’s work (Ibid 159). In asking our students to think of their projects as social practice, were they not engaging with these discourses of deskilling? Through streamlining the training process and asking students to forgo some of their learning from previous classes, were we not deskilling some of the intellectual labor of museum interpretation? Conversely, I would also like to argue that these students engaged in a process of reskilling by learning to be more adaptive and improvisatory in their approach to the works in the Museum’s collection. They often sidestepped certain art historical lines of inquiry in favor of interpretations found in other disciplines, as well as understandings from personal life experience. In learning these skills and in rejecting others for the purposes of this class, I should stress it was not our intent to supplant the skills and knowledge these students were learning in other classes, but rather to provide them with alternative tools for interpretation. Nor was it our goal to replace our experienced docent core with students. Instead, we hope that our work with college students opens up the role of interpretation in the Museum to new voices. After all, we can learn a lot ourselves from the openness, curiosity, and enthusiasm found among students at this crucial stage of life. 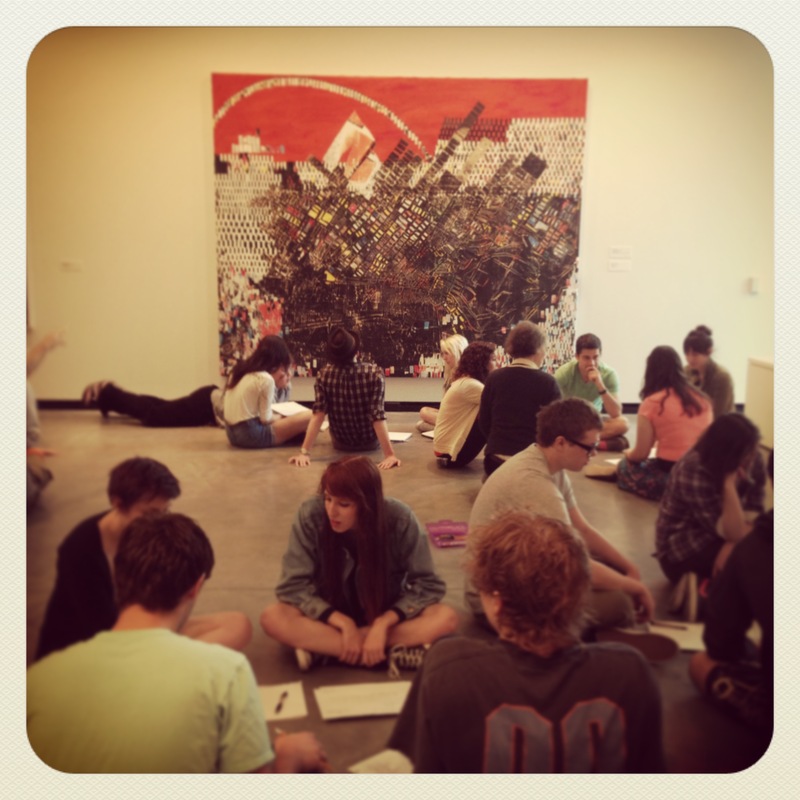 I welcome comments from those of you who have also worked with college students as educators in your museum. What worked in your program and what did not? Furthermore, I would love to hear thoughts on the intersection of social practice and museum education, as well as the place of re- and de-skilling in the museum.